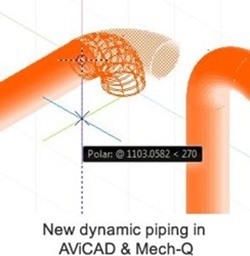 Our latest Mech-Q release offers a new piping and features that integrates inside our engineering and pipeline software suite and allows CAD users to dynamically rotate various fittings into place at any angle. The Mech-Q Suite is available for AutoCAD and IntelliCAD as an add-on. The Mech-Q Suite can optionally be purchase as a part of a 2D/3D CAD stand-alone package called AViCAD Pro. Pipe fittings now appear immediately after the ‘Point Direction’ pick is made. When the fitting comes in at this point the user will be able to see the fitting while picking a new direction. This addition is a powerful feature for 3-D mechanical detailing. Now piping designers can create 3D models without having to set the appropriate 3D Coordinates (UCS) while designing their schematics.